This research raised about China’s foreign policy to the nuclear issue of North Korea. The writers questioned why China approves Resolution 2270 the year of 2016 that emphasizes economic sanctions for North Korea firmly. In answering the question of research, the writers focused on the concept of foreign policy decision making Richard Snyder to analyze the decision making process in China to the Resolution 2270 with qualitative research methods and explanative data presentation. The hypothesis submitted by researchers is the stance of China in approving the Resolution 2270 cannot be released from internal factors and external factors considered by the decision maker in actualizing image of China as the Responsible Great Power and strategic culture that makes China prefer solution North Korea nuclear issues through the mechanism of the UNSC. The decision of China to the resolution of the UNSC 2270 intimately connected with the actualization of the image of China as a Responsible Great Power and the strategic culture of the Chinese defensive, non-intervention and a preference for the multilateralism. RUHMIYATI, Ruhmiyati; INDRAWATI, Indrawati. Perubahan Sikap Tiongkok atas Resolusi DK PBB 2270 tentang Nuklir Korea Utara Tahun 2016. TRANSBORDERS: International Relations Journal, [S.l. ], v. 2, n. 1, p. 44-66, dec. 2018. ISSN 2598-9200. 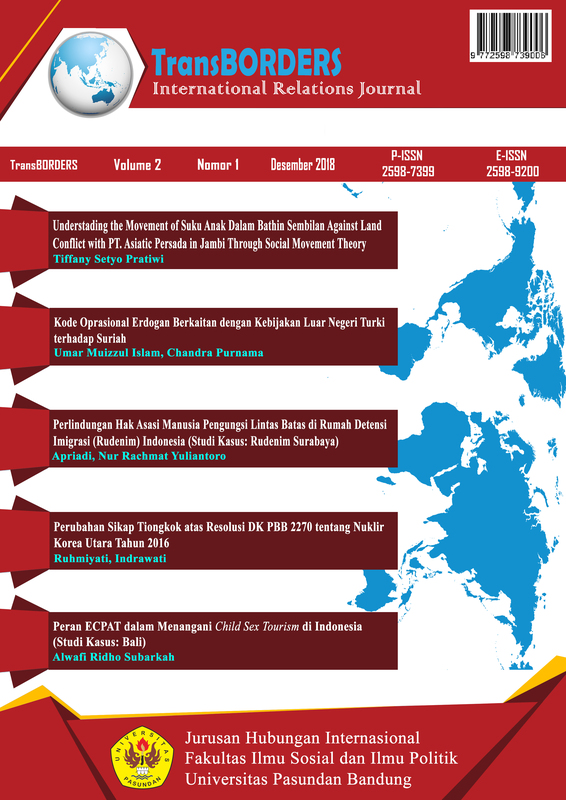 Available at: <http://journal.unpas.ac.id/index.php/transborders/article/view/1136>. Date accessed: 18 apr. 2019. doi: http://dx.doi.org/10.23969/transborders.v2i1.1136.